The idea of designing this wall-mounted dog treat/leash combination came from my niece’s most recent request. She is a big dog lover and also thinks her uncle can build anything! I love her confidence in my woodworking skills, so I’m wasn’t about to burst her bubble by telling her just what a “wood butcher” I really am! Anyway, my niece recently asked me to make her something she could hang on the wall that would have two doggie treat containers and two leash hooks for her ‘Babies” (dogs). What I came up with was what you see in the photo below. The puppy treat are held in one pint “MASON” canning jars that are set slightly recessed on the lower plates. The top plates pivot open and close on wooden dowel hinge pins to make treat access quick and to make jar removal for refilling/cleaning easy. The photo model is made of pine and painted with a “Crackle Paint” finish. I’m so glad my niece liked this mantel combo! Plus, several other people have already asked me to make them one, so I thought this might make a great woodworking plan project for Klockit’s woodworking customers. 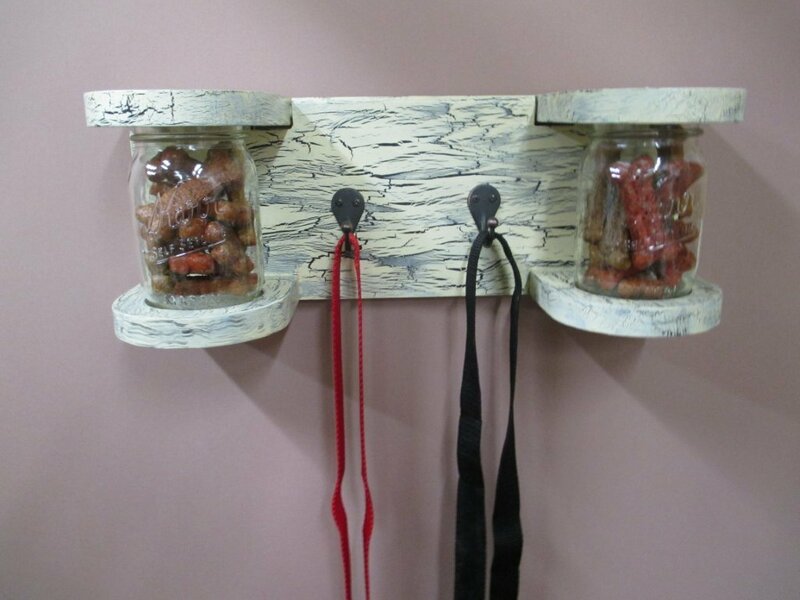 The woodworking plan to make this dog treat wall combo will be released in the near future. You will find it to be an easy project and a finished product that will undoubtedly sell well at craft fairs. It will also make the perfect gift for your family and friends with dogs.